Hello people of Animal Jam. Today's new item is Rainbow (their not rainbow!) 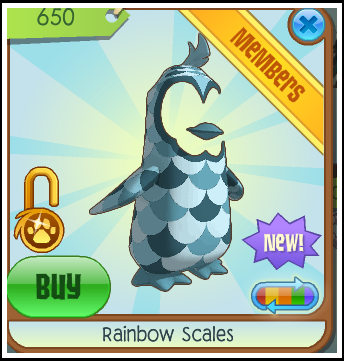 Scales! I put a cool frame on it. :P Umm.... By the way it doesn't only go on penguins, though I know it looks that way. Sorry for not posting FOREVER. I do play Animal Jam every day (so far), and still don't post often. Anyways, as most of you see, I removed Four Stories. I just don't think it suits my blog, so I'm just gonna ask you to write something. "Go write about a rainbow". :P No don't go write about a rainbow. I think I just got an idea for the next contest. Anyways, until my next contest, go write about a wolf who's tail is on fire.